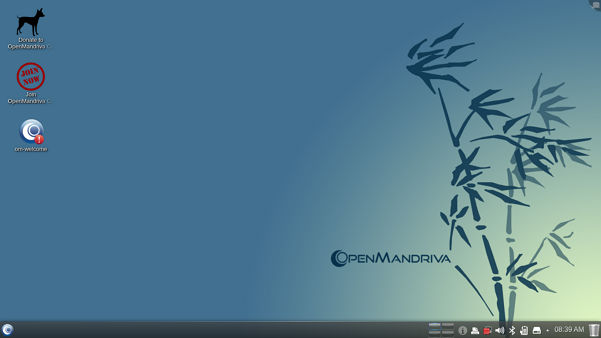 ‘OpenMandriva Lx’ is a community maintained GNU/Linux distribution that is based on the Mandriva Linux’s Free edition (now abandoned). It has been many years since I last tried Mandriva, and it was actually one of the first distributions that I used (it was then called ‘Mandrake Linux’), so I was very excited to see this release. 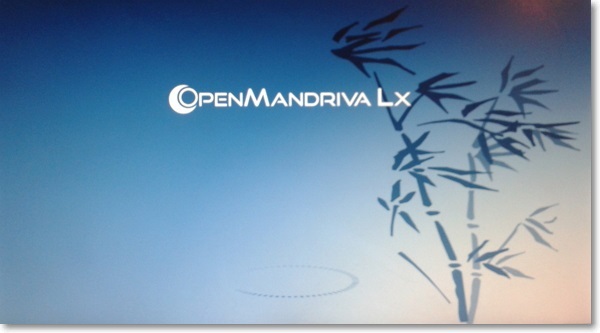 That said I had no high hopes for ‘OpenMandriva Lx 2014.0’ as it is just two years old, although it was founded by few former employees of ‘Mandriva’ and they (including many other developers) spent about an year developing this, the second, release, I suspected that it might not be as stable (yet) or polished as other KDE based major distributions. Another reason that tempted me to try it out was due to this release’s (code named ‘Phosphorous’) adaptation of a patched Kernel (3.13.11 nrjQL) that uses ‘BFS’ task scheduler (that which governs processes) & ‘BFQ’ disk I/O scheduler (disk I/O governor), both of which are known to improve the responsiveness of GNU/Linux. It also comes with ‘UKMS’ (an improved memory manager), KDE 4.12.4, new artwork (GRUB2, Plymouth, Splash, KDE theme, Screensaver …), an installer that is improved to be intuitive & one that supports UEFI, including many other changes, according to its release notes. As usual I first measured the performance related details (boot-up times, memory usage …) after installing the OS, before ‘touching’ any application or settings, though they are listed at the end of the article. So I created a Live USB and boot into it right away and notice the following. 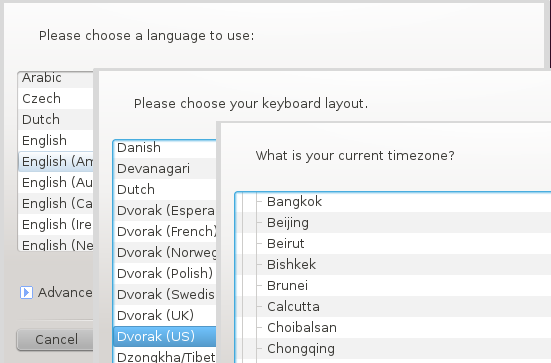 Unlike other distributions that I have used so far, before booting into the desktop, the Live desktop session lets you set the Language, Keyboard layout, Time Zone, network & printing related settings, and hence they are not available in the installer. I tried to install it alone side with Windows 8.1 The installer was easy to use but when I tried to format the Ubuntu 14.04 LTS partition for installing ‘OpenMandriva Lx 2014.0’, it failed to do so. Later I realized that you actually only have to set a ‘mount point’ and click next and then the partition is going to be formatted automatically (after manually conforming it of course) on the next step. So it was no big deal. If you make changes to a disk that requires updating the ‘MBR’ (master boot record) -- say deleting and creating a new partition, then the installer asks you to reboot for the changes to take effect. 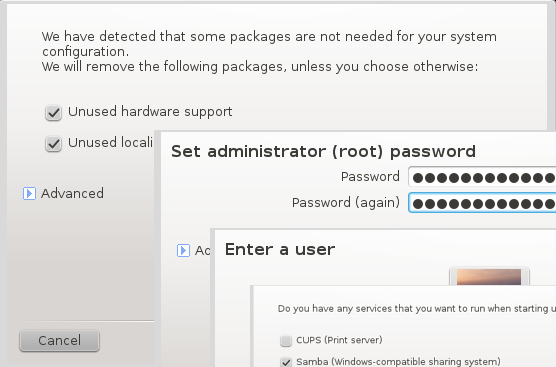 This is not necessary under other installers (such as in Ubuntu). While installing, the installer also gave me an error saying it failed to fetch some updates from an online server (I had a working internet connection), but it did not affect the installation. Creating the default user account and setting up the Root password are also not presented within the installer, and they are only presented to the user when booting for the first time. I think it would be better if those were too integrated into installer. Other than those, all went well and I was quite happy about the installer. I like the GRUB2 theme used in ‘OpenMandriva Lx 2014.0’. Unlike the one that has complicated looking menus in Ubuntu for instance, this one looked clear & simple and easy on the eyes as well. The boot-screen was also quite pleasing. When you boot for the first time, the OS asks whether you would like to clean up any software that are not related to your hardware. I do not know if it has any effect on the performance (boot-up speed etc) but I clicked ‘Yes’ and it took around 2-3 minutes. After that I was asked to enter the Root password then to create the default user account and at the final step to enable/disable two network related services and a printing service (‘CUPS’). 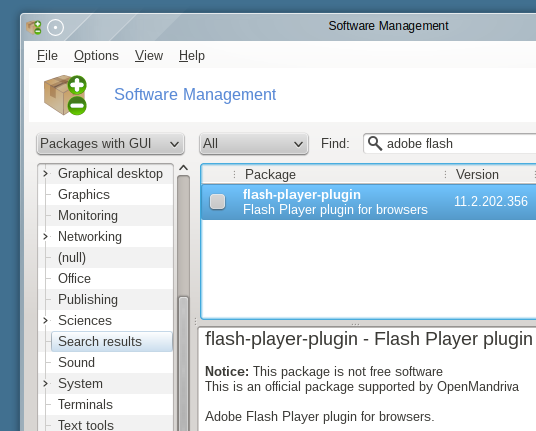 Since the auto-login is not enabled by default, then I was greeted with KDM (‘KDE Display Manager’). 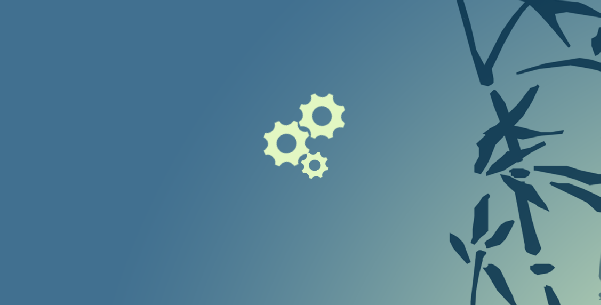 I also quite like the default theme & the splash screen with the animated gears. One thing that I noticed here was that the login from here to the desktop took a reasonably long time (in comparison), somewhat the equal amount of time the system took to boot from ‘GRUB2’ menu to displaying KDM!. This release also features a brand new ‘welcome’ screen that gives a brief introduction as well as the ability to install various popular software utilities (Adobe Flash & proprietary multimedia codecs included) that are not included by default, online manuals & forums and configuration settings. A very handy tool. 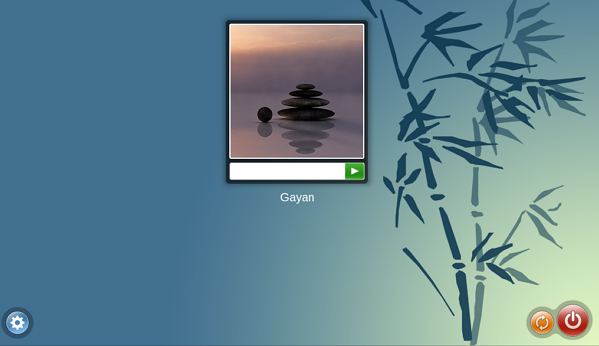 The desktop is presented with the ‘Folder Layout’ enabled with the task-bar located at the bottom. 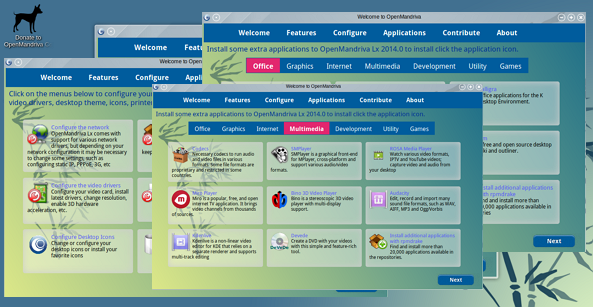 ‘OpenMandriva Lx 2014.0’ uses the ‘Homerun launcher‘ (full-screen mode) for launching applications & file browsing and it displays the content under four tabs. When you search for an application or a recently opened file, it lists them with very little delay. Excellent. I also liked the default wallpaper (a blueish background with a bamboo tree, if I am not mistaken) & there are bunch of others included as well. As mentioned in the beginning, ‘OpenMandrive Lx 2014’ comes with a patched Kernel (3.13.11 nrjQL), X.Org 1.15.1, Mesa 10.1.0, systemd 208, KDE 4.12.4 (which includes ‘Dolphin 4.12.4’, ‘Amarok 2.8.0’, ‘Gwenview 4.12.2’, ‘KGet 2.12.4’, ‘K3b 2.0.80’, ‘KRite 2.8.2’, ‘Kamoso 1.90’ -- webcam utility, ‘LibreOffice 4.2.3.3’ and many others), VLC 2.14 (can play some content but not all of them, for that you will have to manually install the proprietary codecs), ‘PulseAudio’ volume controller, Firefox 29.0 are some to mention. The default software app/remove tool (GUI) is called ‘Rpmdrake’. It consumes a lot of memory when running (about 144MiB at idle), but it is quite an intuitive tool by using which even a new user should be able to search (or choose from categories) and install software without much of a hassle. A command-line based tool called ‘urpmi’ (it is the underline tool ‘Rpmdrake’ uses) is also available as well. Like in ‘SUSE Linux’, the original distribution ‘Mandrake’ was known for its truly amazing ‘control center’ that let users easily configure system services, scan & change hardware drivers, add/remove users, manage installed software & tweak a huge number of system settings. 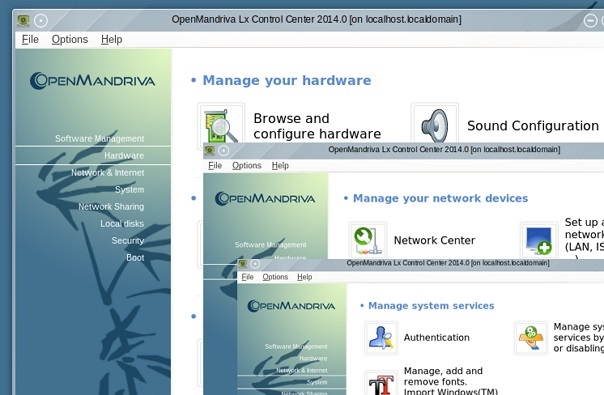 In ‘OpenMandriva Lx’ too you get a truly superior control center!. ‘OpenMandriva Lx 2014.0’ failed to correctly recognize my Bluetooth adaptor, although the ‘Bluetooth’ icon was displayed at the notification area, I could not add a device nor Turn it OFF. The fingerprint reader was also not recognized, but it is not yet supported by the Kernel, so it is not the distribution’s fault. Every now and then, the OS gets stuck when booting & also happened once during a shutdown. Quite irritating. Other than that, all else works just fine (video card, webcam, audio …). ‘Suspend’ takes about 3-4 seconds but wakes up very quickly, and unlike in few other distributions, the screen brightness settings do not get reset at the desktop login (good!). 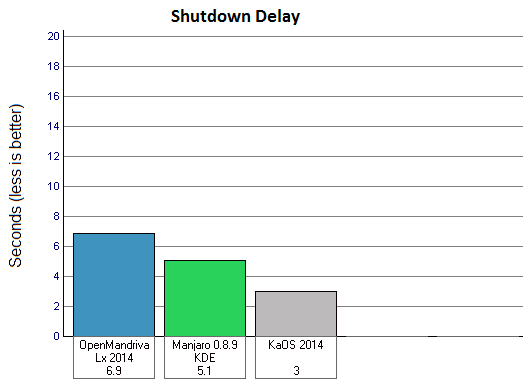 As always, I took five samples of each of these tests (except for power usage -- because the tool that measures it takes a lot of samples spanning over a few minutes, CPU idle & system responsiveness) and compared them with the data that I have for ‘KaOS 2014-02‘ and ‘Manjaro 0.8.9 KDE‘ since they are both KDE based distributions. Also, before taking the measurements, I made sure to boot the system 6-7 times for letting things to settle down. The only change I made was disabling the ‘Welcome’ screen from starting up with the desktop. So, without any further delay, let me provide you with the details. 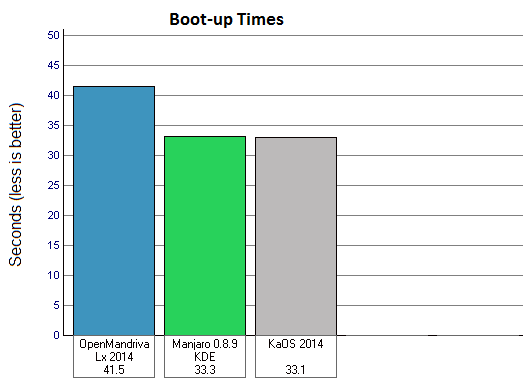 As you can see below, ‘OpenMandriva Lx 2014.0’ was the slowest to boot (25% slower compared to ‘ ‘Manjaro 0.8.9 KDE’ & ‘KaOS’, roughly). When the desktop was fully loaded and let idle, the memory readings were also high. 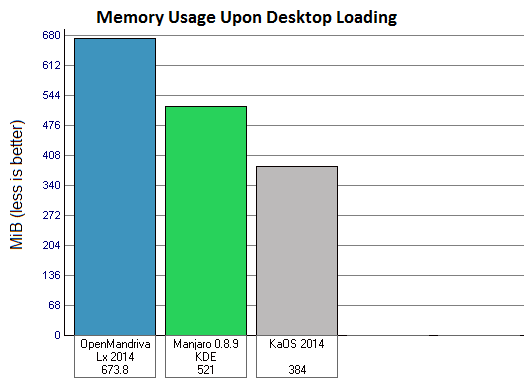 When compared to ‘Manjaro’ it was about 29% & 75% higher when compared to ‘KaOS’!. I cannot point out the exact reasons, but I did notice few startup services in ‘OpenMandriva Lx’ that consumed reasonable amount of RAM. For instance, a ‘mysql’ related service is started by default (which I think is one of the reasons for its slow boot) and it alone consumes about 95MiB!. There is also a ‘HP’ related service that consumes around 23MiB, and a firewall is enabled by default, both its service and the GUI consume around 31MiB. 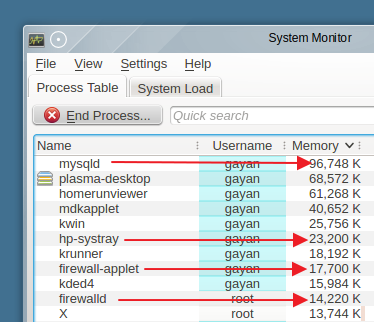 If we cut their memory consumption, then the memory usage drops down to 524MiB. Starting a firewall can be tolerated, but I am not so sure about the ‘HP’ & the ‘MySql’ related services though. As you can see, ‘OpenMandriva Lx 2014.0’ did not ‘score’ well in terms on being a power efficient operating system either. 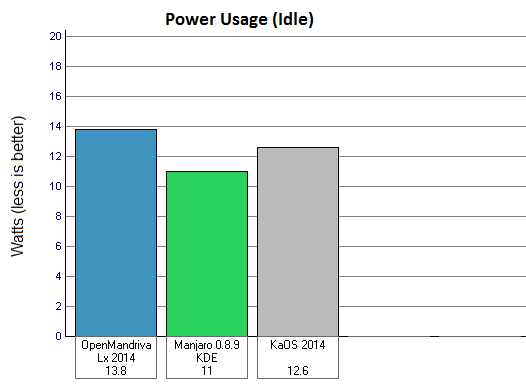 It consumed 25% more power when compared to ‘Manjaro’ & 9% compared to ‘KaOS’. Prior to measuring power, I had disabled the screen being dimmed down, brightness set at its maximum value, Wi-Fi turned ON, not sure what the scenario was with the Bluetooth adaptor since it was not recognized, had turned OFF the screensaver & let the system idle. In any case, ‘OpenMandriva’ does not seem to come with power usage optimizers that some other major distributions use these days such as ‘Laptop-Mode-Tools’, ‘TLP’ or ‘pm-utils’. 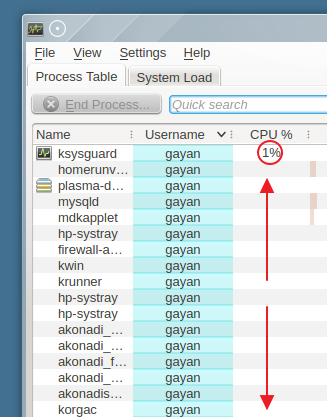 As shown above, KDE’s system monitor kept using 1% of the CPU most of the time (not continuously though) but other processes did not get involved, for long periods. Very good. Except for ‘KaOS’, I was very disappointed with the responsiveness of all the other KDE distributions that I have used in recent times. However, as mentioned in the beginning, ‘OpenMandriva Lx’ comes with one of my favorite disk I/O governors, ‘BFQ’. It has worked wonders when I tested it. To put it into simple terms, this disk I/O governor has the ability to significantly improve the system’s responsiveness under heavy load, thus I had high hopes for ‘OpenMandriva’ as well. So I carried on with my test for testing the OS’s responsiveness. While copying a file (about 1.5GB) within the ‘Home’ folder, I tried to play a video through VLC, then clicked on the ‘Homerun Launcher’ and searched and opened ‘Konsole’, LibreOffice Writer & Calc, Krita, then opened Amarok & K3b by navigating through the tabs and menus. So how did it all go ? It went really well!. Not only VLC played the file without major playback breaks (except once or twice which were very very minor) all the other applications opened without making the mouse pointer looking stuck … I was very happy. I ran this test again (after a reboot), and this time while opening an app or two (while the file copy was being copied), I tried to browse through folders in ‘Dolphin’. I would not say it was excellent, but it was acceptable. So all in all, I was very happy with the responsiveness ‘OpenMandriva Lx’ delivered under disk I/O stress. Just this once ‘OpenMandriva Lx’ got hung up but in all other instances it turned off my laptop without any issues. It is 35% slower while shutting it down when compared to ‘Manjaro’ & 130% when compared to ‘KaOS’. When compared to recent versions of two other KDE distributions, it is slow to boot, consumes more memory, could not recognize my Bluetooth adaptor & the system gets stuck every now and then. On the positive side, if you can accept all that, then you will get a KDE desktop that is responsive & easy to configure (if you know what you are doing! ), though my feeling is that there is still room for few refinements. But for a distribution that is barely two years old, this release marks a great achievement nonetheless!. As always, the choice is yours. If interested, please visit this page for downloading it & here is the release notes page. Thank you for reading. Sanjay, I have high hopes for Open Mandriva 2014, but my favorite kde Distro is still Netrunner, now on version 14 (standard and rolling releases available). It has the homerun launcher and a “kicker” menu that is very Windowsy. Many thanks for the review. I used the old Mandriva right up to the organization falling apart, and am anxious to begin again. Sounds like we should wait awhile, tho. You made no mention of rolling release. Do you know about this? You’re welcome Kevin. About the ‘Rolling Release’, no, as far as I know, ‘OpenMandriva Lx’ is not released in such a manner. I am not sure if its hardware issue, but my machine gets irresponsive when waked up from hibernate/sleep mode. I am using HP 2000 Laptop. Appreciate help if someone else has faced similar issue. of reviewers that only tell me an opinion of their likes and dislikes without actually testing the system. It was a refreshing read to actually read a productive review of a Linux distribution. It is a positive review and it is so in its intelligent review of the parts of a Linux system that really matter. It is a well-balanced review because it does not leave you with the wrong impression of the hard work required to implement a distribution. now test this distribution from the OpenMandriva Association. You’re welcome Jason, & thank you very much for the appreciation 🙂 . 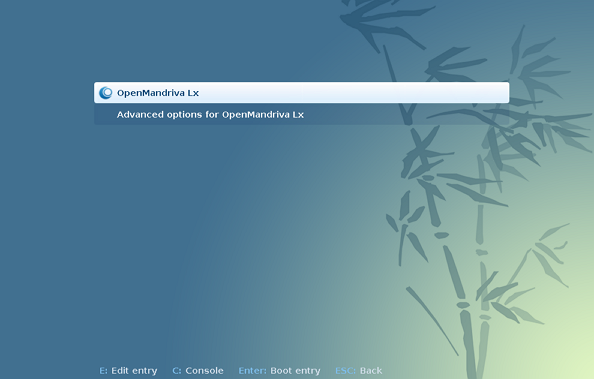 OpenMandtiva Lx 2014.1 is available!